A KC-46A Pegasus refuels an A-10C Thunderbolt II during a test flight on July 15, 2016, one of a series of test refuellings to test the hydraulic pressure relief valves installed on the KC-46A to correct higher than expected axial loads in the boom. A Royal Australian Air Force KC-30A refuels an Armee de l'Air E-3F Sentry during flight trials of the Aerial Refueling Boom System. 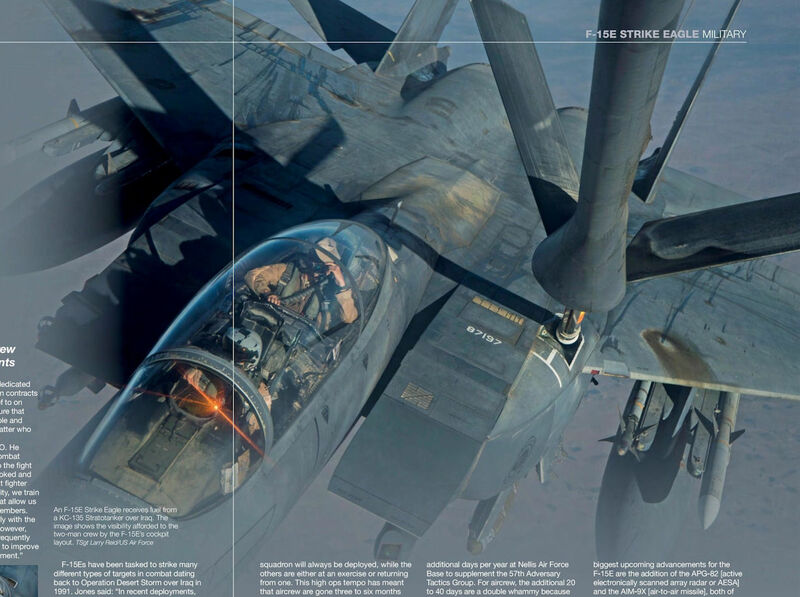 An F-15E Strike Eagle receives fuel from a KC-135 Stratotanker over Iraq. 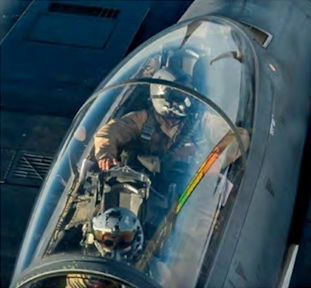 The image shows the visibility afforded to the two-man crew by the F-15E's cockpit layout. 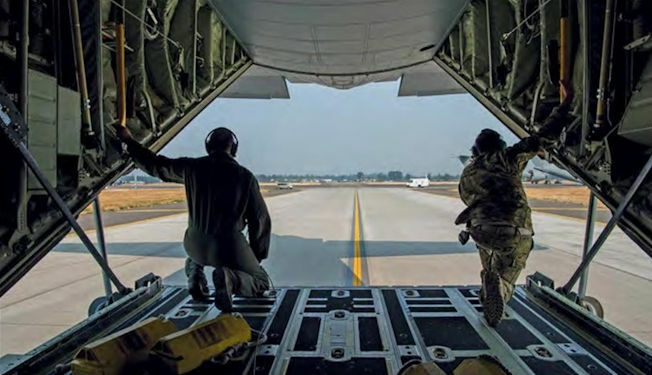 US Army soldiers board a C-130J Hercules from the 61st Airlift Squadron, for a paratroop drop at Fort Bragg, North Carolina. A new ticket distribution agreement with easyJet, one of whose A320s is in the background in this shot of a Saab 340 at Glasgow, is a partnership Loganair is hoping will help establish its market presence. The first flight undertaken by the newly-rebranded Loganair using Saab 340 G-LGNG (c/n 327) taxies in at Glasgow following its arrival from Islay. 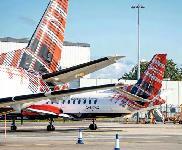 At Glasgow, one of Loganair’s key hubs on its network of routes around Scotland, Saab 340 G-LGNG (c/n 302) was greeted by bagpipes at the end of the carrier’s first flight as an independent carrier again. 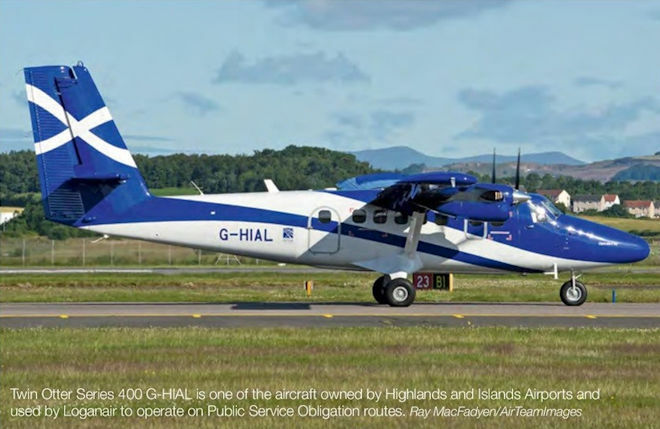 Loganair believes emphasising its Scottish identity gives it an advantage on the marketplace. 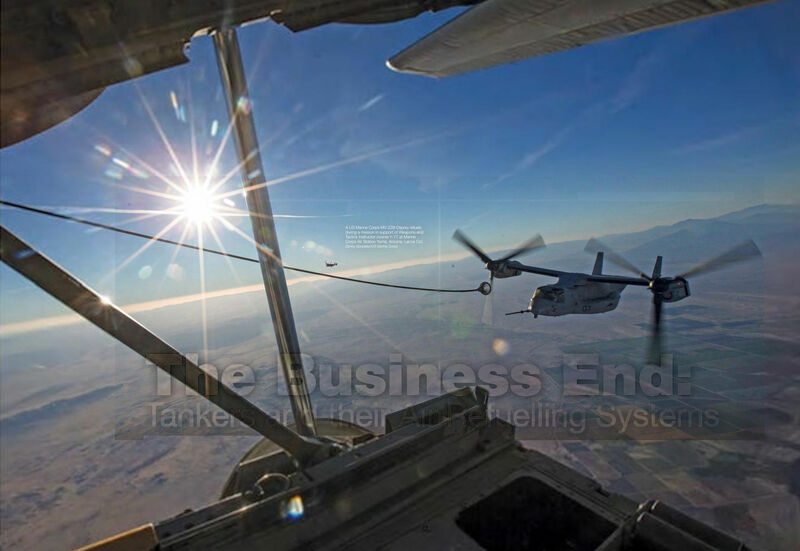 A US Marine Corps MV-22B Osprey refuels during a mission in support of Weapons and Tactics Instructor course 1-17 at Marine Corps Air Station Yuma, Arizona. VMU-4 is the last operator of the AAI RQ-7B Shadow UAS in the US Marine Corps, and will begin transitioning to the Boeing-Insitu RQ-21A Blackjack early next year. 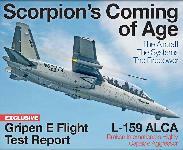 The wildlife survey missions flown in August 2017 were actually the squadron's penultimate flight operation with the Shadow. A ‘short-wing’ RQ-7B awaits assembly at the HOLF. 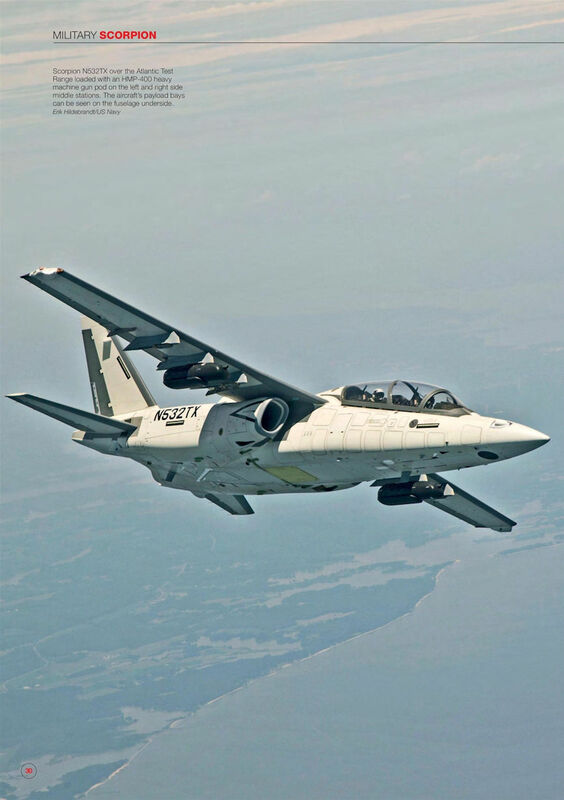 With six hours endurance and Camp Pendleton’s ranges only a short flight away, VMU-4 typically opts for the short-winged Shadows for local missions, versus the long-winged variant, which offers nine hours endurance. Capabilities between the two are the same, only the long-wing RQ-7 takes longer to defuel after shorter missions. Marines inspect an RQ-7 launcher prior to sending a Shadow up on a wildlife survey mission. Most of VMU-4's Marines are reservists, and the wildlife survey flights were scheduled for one of the squadron’s monthly drill weekends. 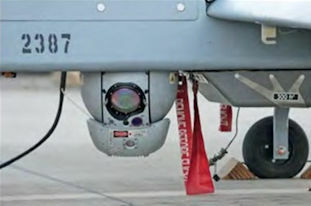 The Shadow’s primary payload is the IAI POP300 electro-optical/ infrared sensor turret, equipped with a laser designator. 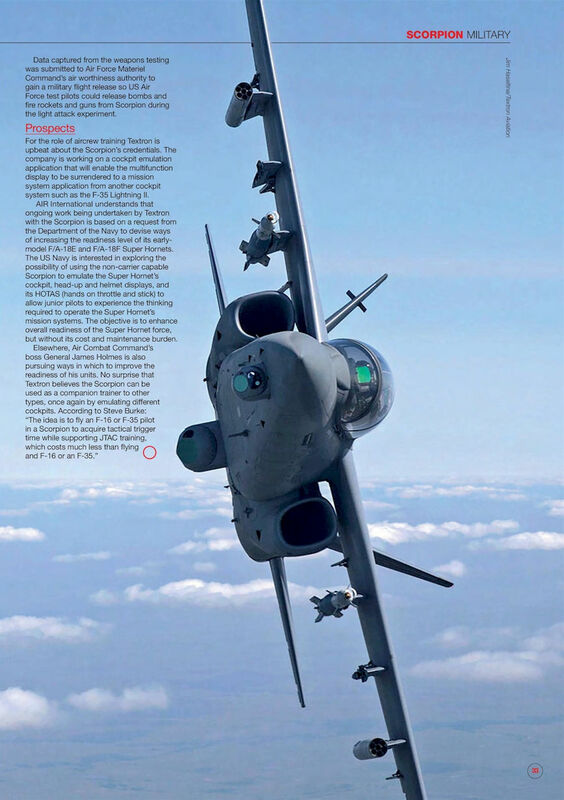 The POP300 can generate ten-digit target coordinates, precise enough for GPS-guided weapons, but also useful for other functions, like pinpointing where a southern mule deer was spotted. 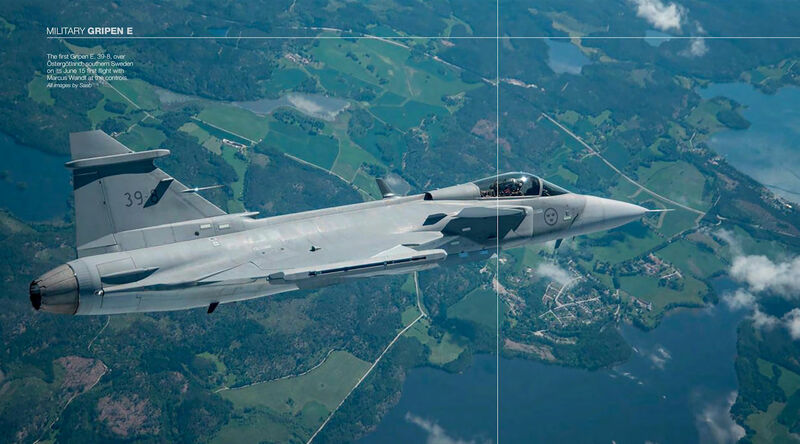 This image shows to good effect the type of terrain VMU-4 has to contend with while operating out of the HOLF. 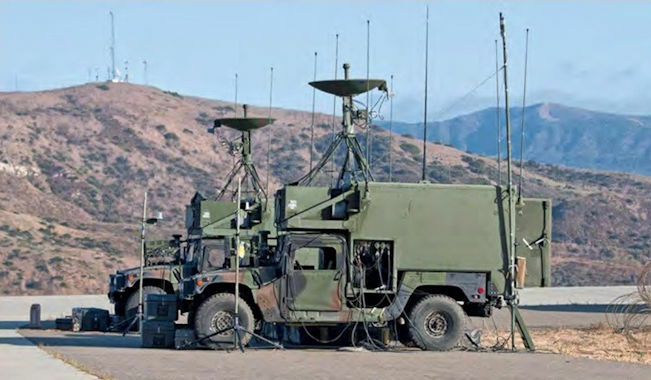 While undeniably scenic, Camp Pendleton's large hills force the RQ-7B to higher altitudes to maintain electronic line-of-sight with the ground control station. In the foreground are two of VMU-4's ground control station vehicles. The GCS is effectively the ‘cockpit’ of the RQ-7. 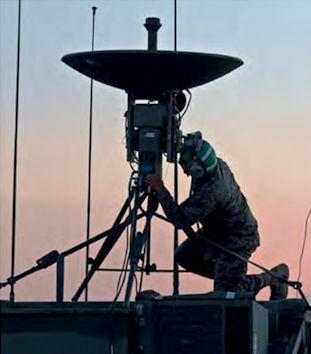 One of VMU-4’s Marines inspects the main antenna on a ground control station prior to a night-time wildlife survey mission. 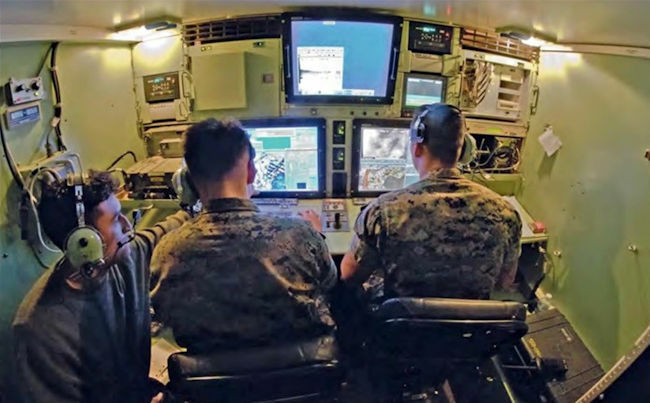 A typical RQ-7B crew consists of an air vehicle operator (left) who flies the aircraft, a mission payload operator (right) who operates the sensors and communications payloads, and an unmanned aircraft commander (UAC, not pictured), an officer in a nearby command centre. The UAC is often accompanied by an intelligence specialist assigned to the squadron. On this flight, the UAC was accompanied by game wardens and wildlife biologists. 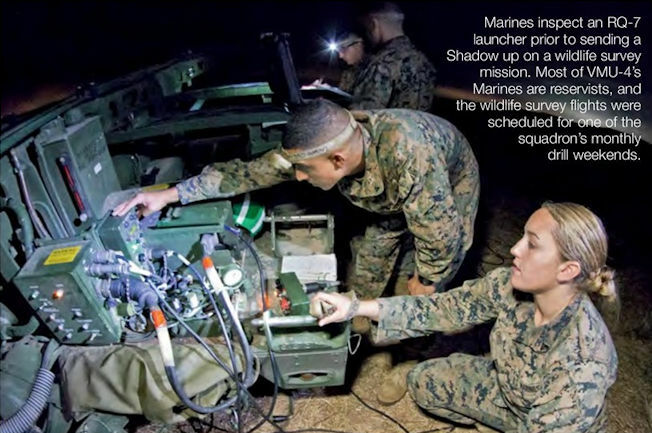 Instructors often sit in on RQ-7B flights, which is the case with the Marine pictured at far left in this image. The second survey flight of the weekend was cancelled when clouds moved into the area almost immediately after the RQ-7B for this mission was launched. 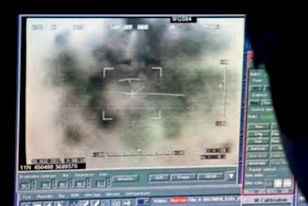 Looking at the mission payload operator’s screen, it is clear just how thoroughly these clouds obscure the ground. 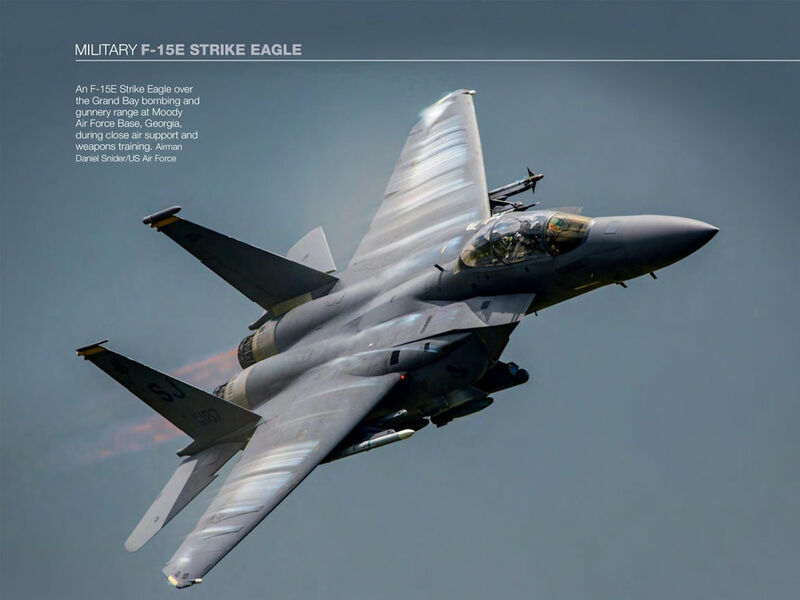 An F-15E Strike Eagle over the Grand Bay bombing and gunnery range at Moody Air Force Base, Georgia, during close air support and weapons training. An F-15E approaches the flying boom of a KC-10 Extender for aerial refuelling during a strike mission in support of Operation Inherent Resolve. 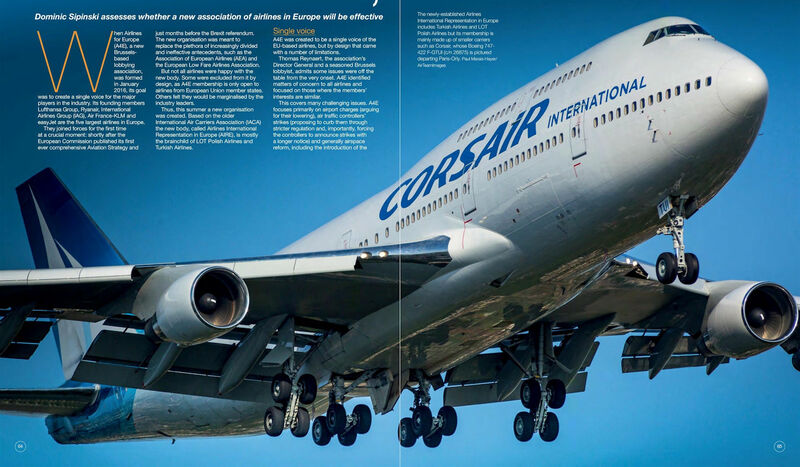 Lufthansa is one of the big five European airlines which in January 2016 formed Airlines for Europe, a new Brussels-based lobbying association to create a single voice for the major players in the industry. Here A350-941 D-AIXC (msn 87) is pictured at Tel Aviv. 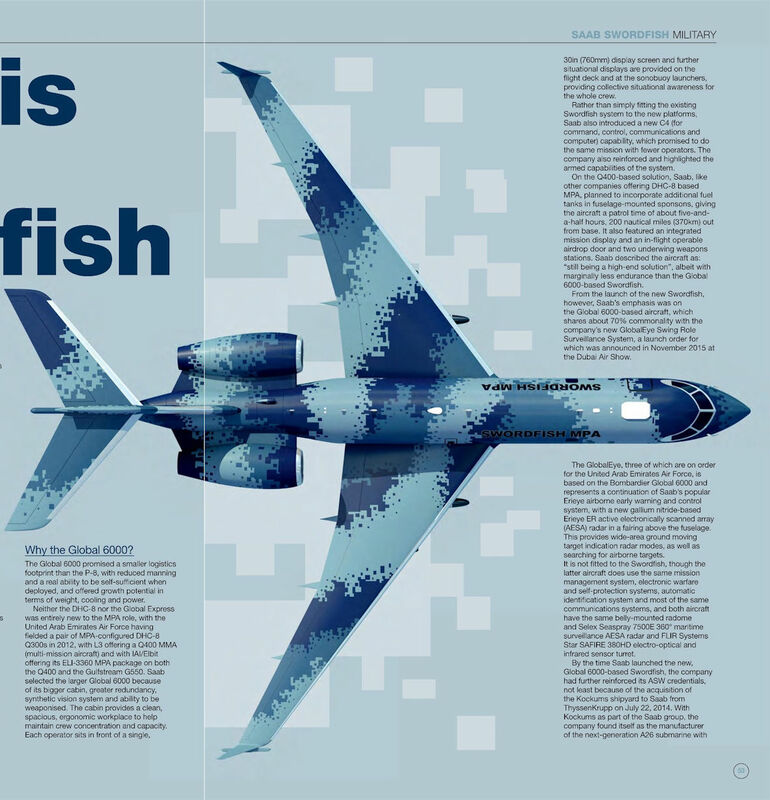 The KC-390 was designed from the outset to be an air refuelling aircraft for both fixed and rotary wing receivers. Fuel is transferred via removable Cobham underwing pods. 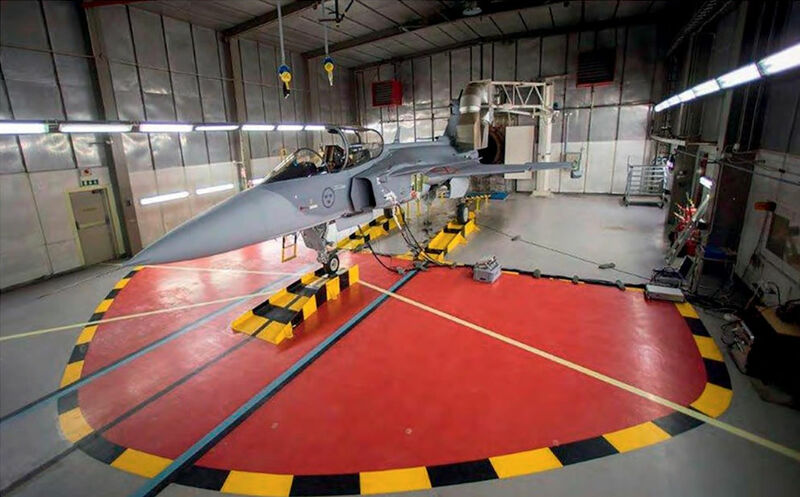 Aircraft PT-ZNF has already conducted stability tests using high and low-speed drogues. 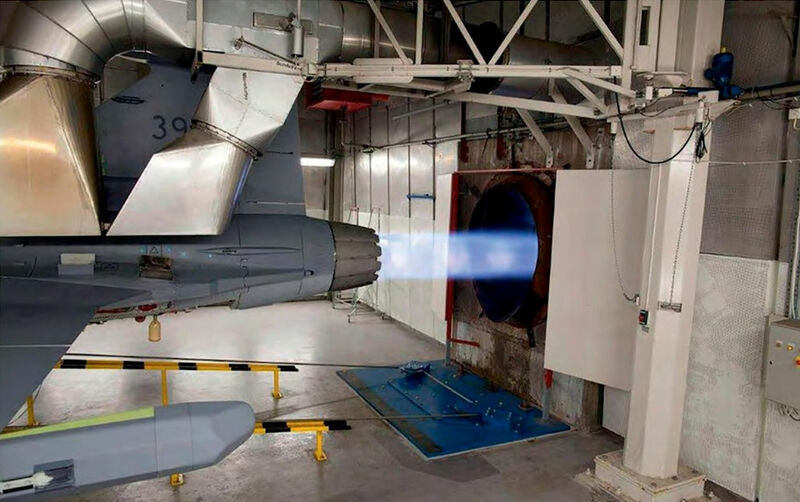 Dry contact air refuelling tests will be conducted before the end of 2016. Up to three auxiliary fuel tanks can be installed in the cargo bay for this role. 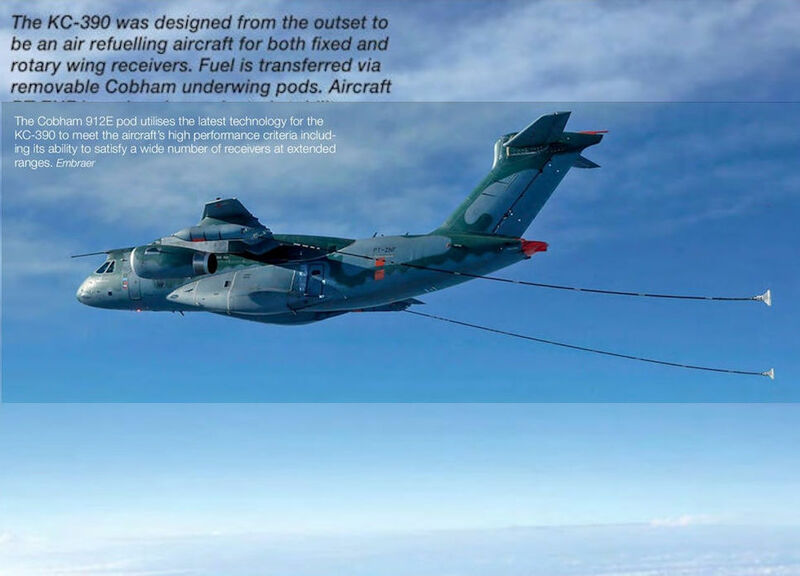 The Cobham 912E pod utilises the latest technology for the KC-390 to meet the aircraft’s high performance criteria including its ability to satisfy a wide number of receivers at extended ranges. A Royal Australian Air Force F/A-18F Super Hornet and a KC-30A Multi-Role Tanker Transport aircraft taxi for a mission in support of Operation Okra from a base in the Middle East. 30 Royal Australian Air Force KC-30A Multi-Role Tanker Transport aircraft awaits its next Operation Okra mission at a base in the Middle East Region. 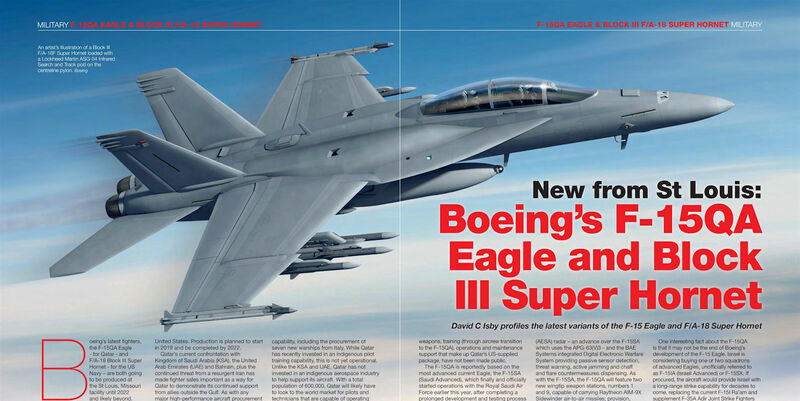 An artist’s illustration of a Block III F/A-18F Super Hornet loaded with a Lockheed Martin ASG-34 Infrared Search and Track pod on the centreline pylon. 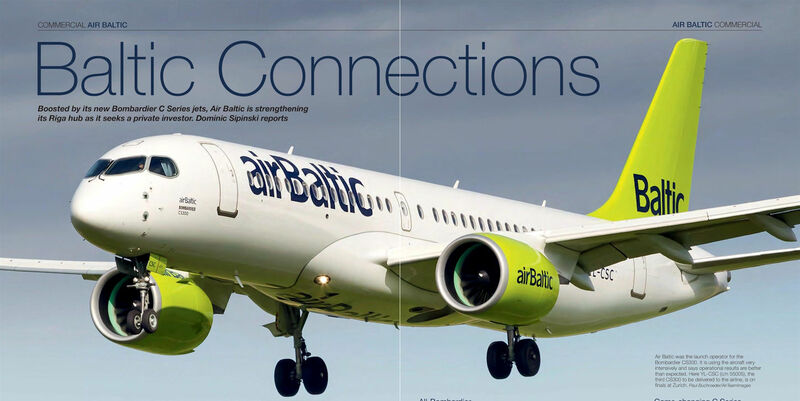 Air Baltic was the launch operator for the Bombardier CS300. It is using the aircraft very intensively and says operational results are better than expected. Here YL-CSC (c/n 55005), the third CS300 to be delivered to the airline, is on finals at Zurich. 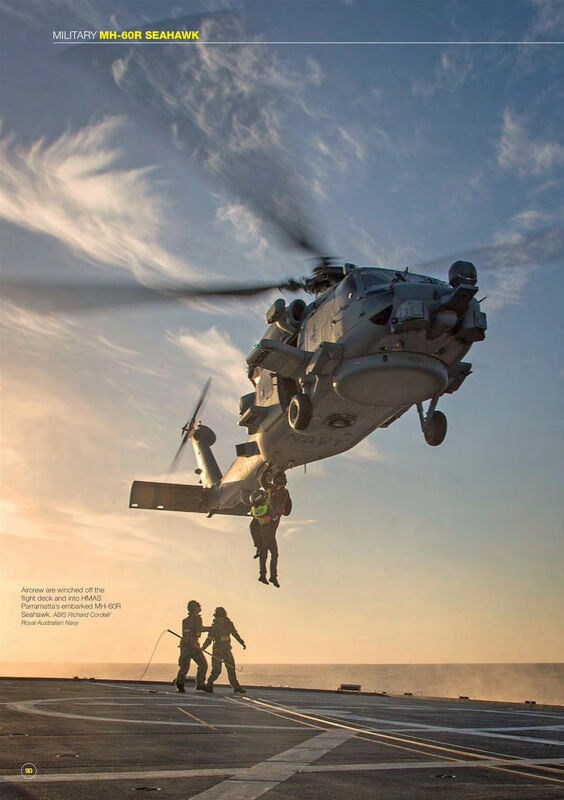 Aircrew are winched off the flight deck and into HMAS Parramatta’s embarked MH-60R Seahawk. 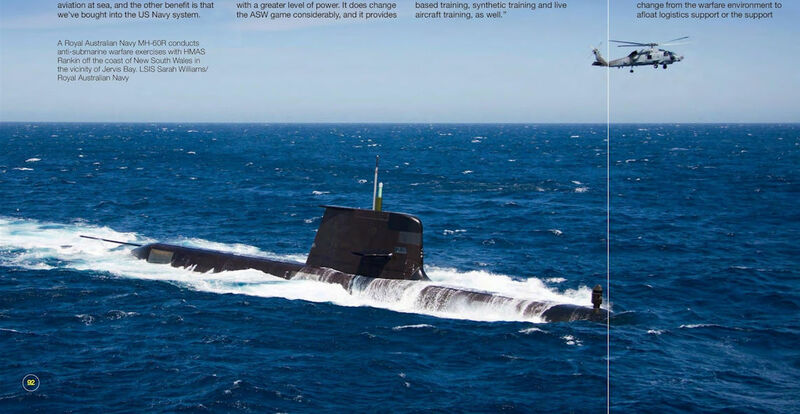 A Royal Australian Navy MH-60R conducts anti-submarine warfare exercises with HMAS Rankin off the coast of New South Wales in the vicinity of Jervis Bay. 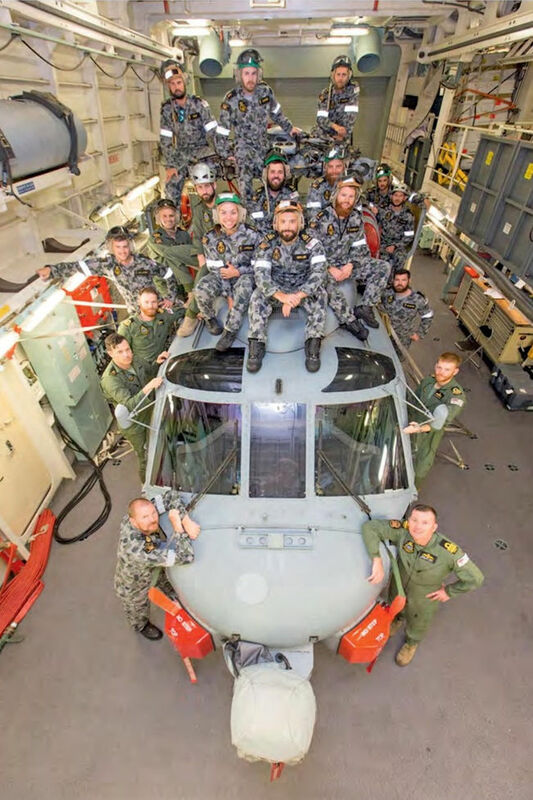 The embarked aviation department with an MH-60R in the hangar on board HMAS Perth. 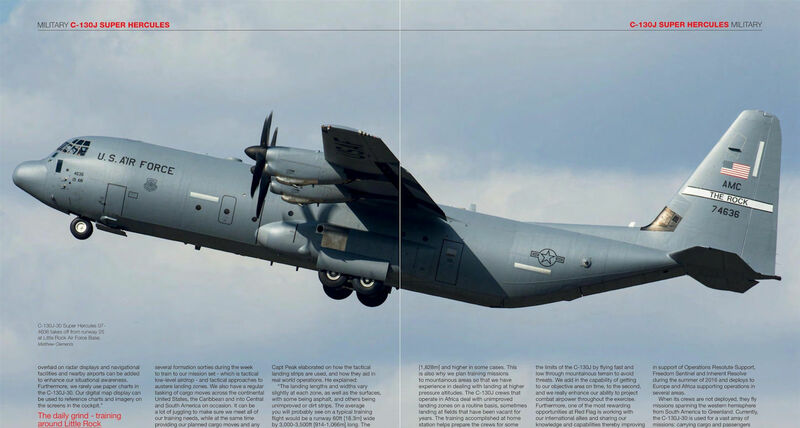 C-130J-30 Super Hercules 07-4636 takes off from runway 25 at Little Rock Air Force Base. 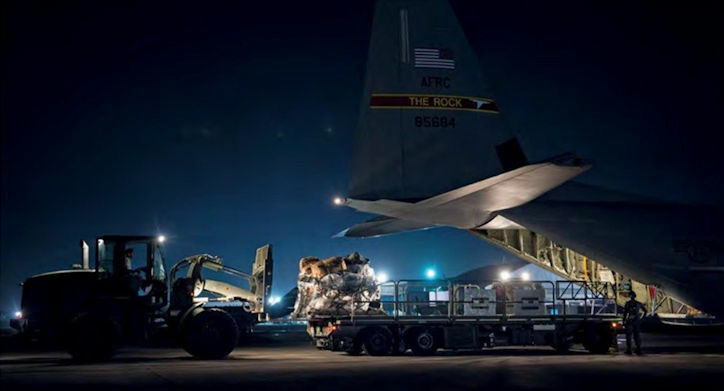 Airmen from the 61st Airlift Squadron remove a pallet from the back of a C-130J on an airstrip in Port-au-Prince, Haiti in support of United States humanitarian relief efforts in October 2016. 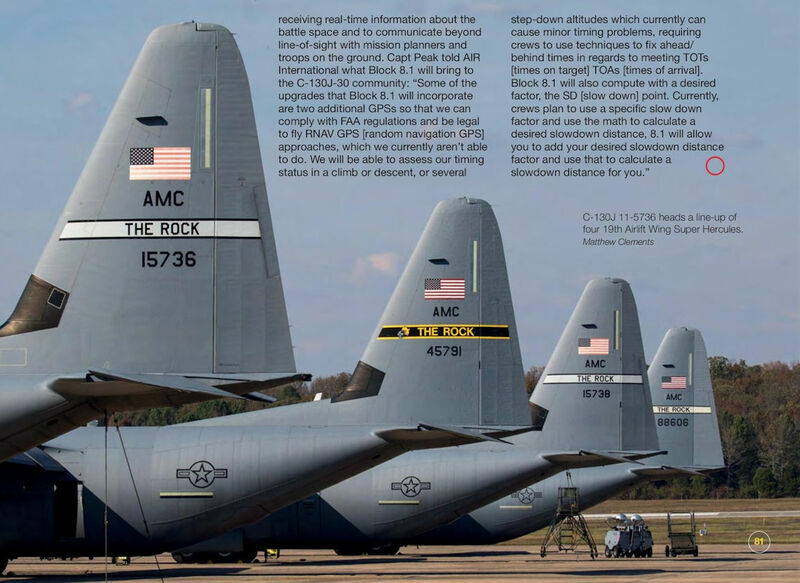 C-130J 11-5736 heads a line-up of four 19th Airlift Wing Super Hercules. 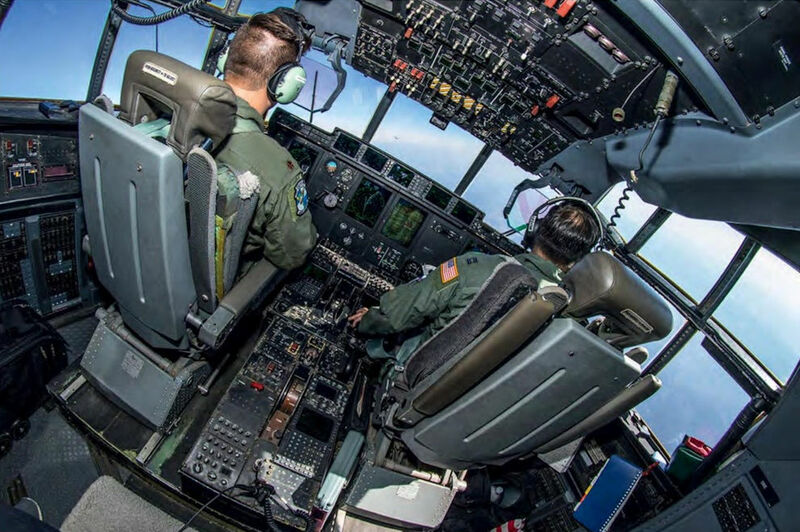 The aircrew of C-130J, radio call sign Raven 11, in a right-hand turn over Arkansas. 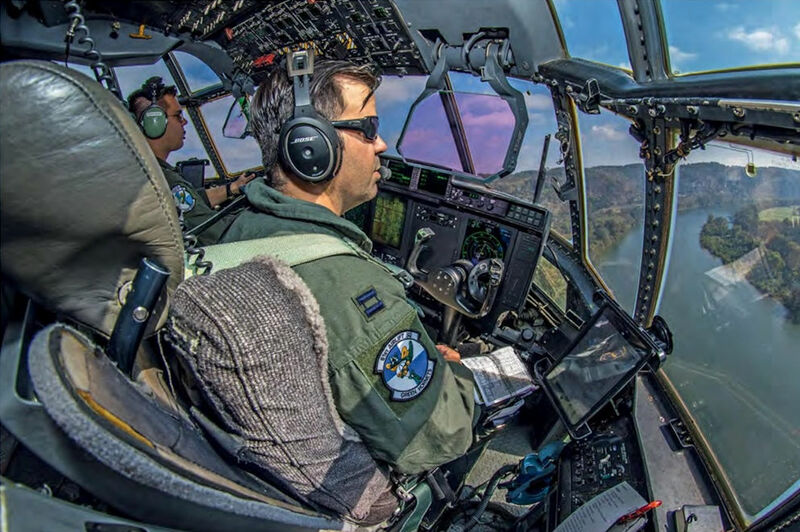 The co-pilot of C-130J, radio call sign Raven 11, observes the Arkansas River during a low-level training flight from Little Rock. Loadmasters from the 61st Airlift Squadron look out the back of a C-130J Hercules during exercise Mobility Guardian at Joint Base Lewis-McChord, Washington on August 7, 2017. 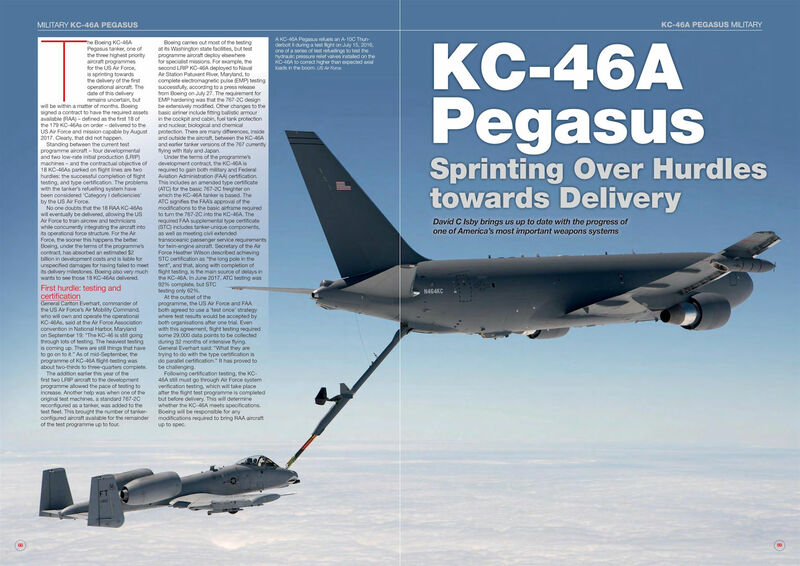 KC-46A Pegasus N462KC arrives at Travis Air Force Base, California on March 7, 2017. 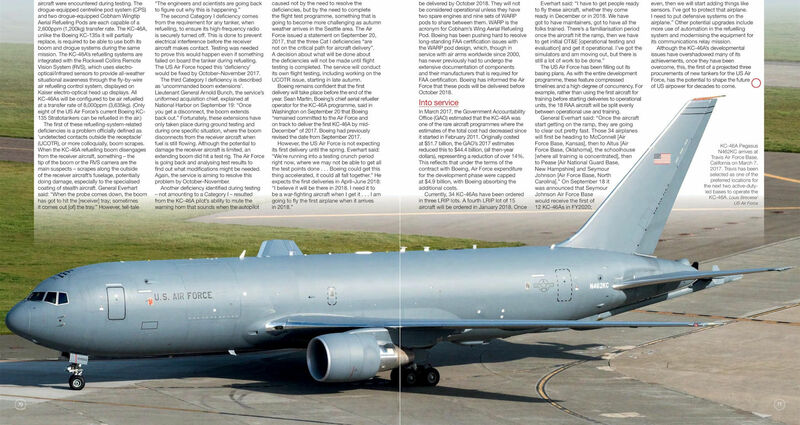 Travis has been selected as one of the preferred locations for the next two active-duty-led bases to operate the KC-46A. 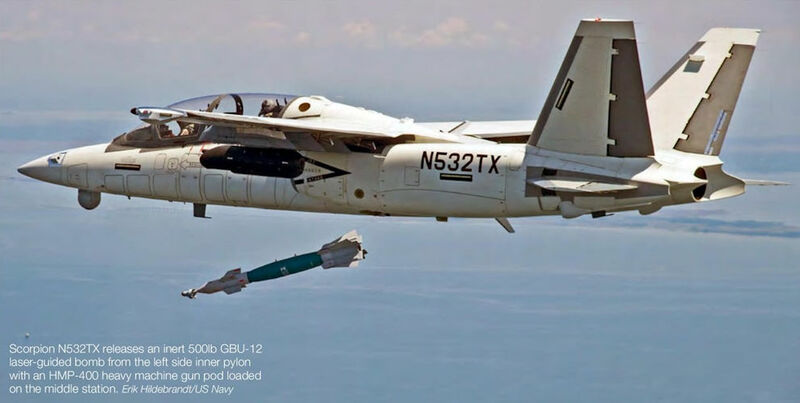 Scorpion N534TX loaded with two GBU-12 laser-guided bombs, two 2.75-inch rocket pods, a Wescam MX-15 multi-spectral sensor turret fitted to the retractable camera mount under the nose and a MX-25 sensor turret fitted to the aft payload bay. 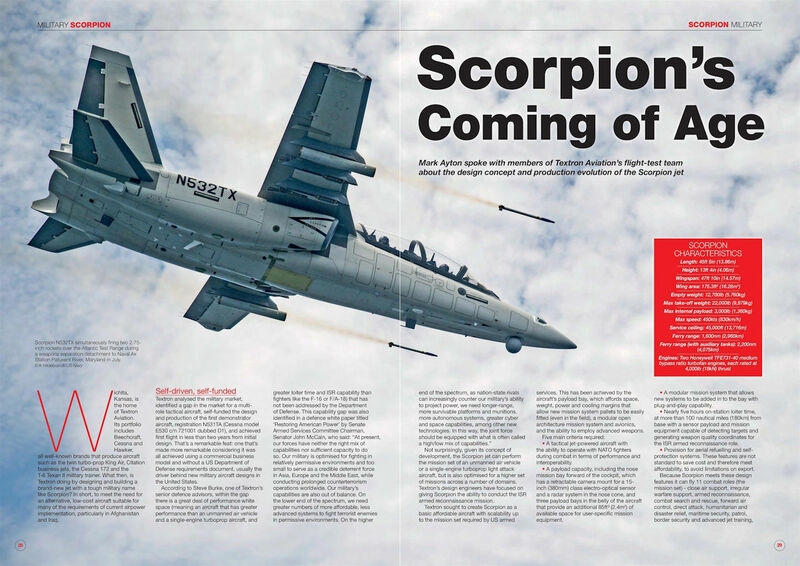 Scorpion N532TX over the Atlantic Test Range loaded with an HMP-400 heavy machine gun pod on the left and right side middle stations. 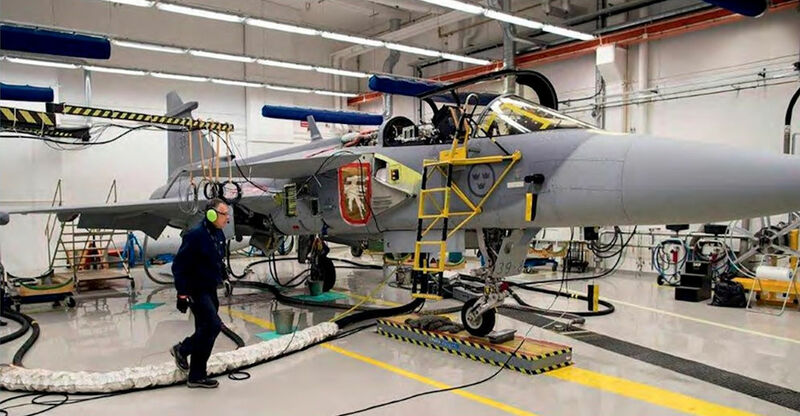 The aircraft's payload bays can be seen on the fuselage underside. 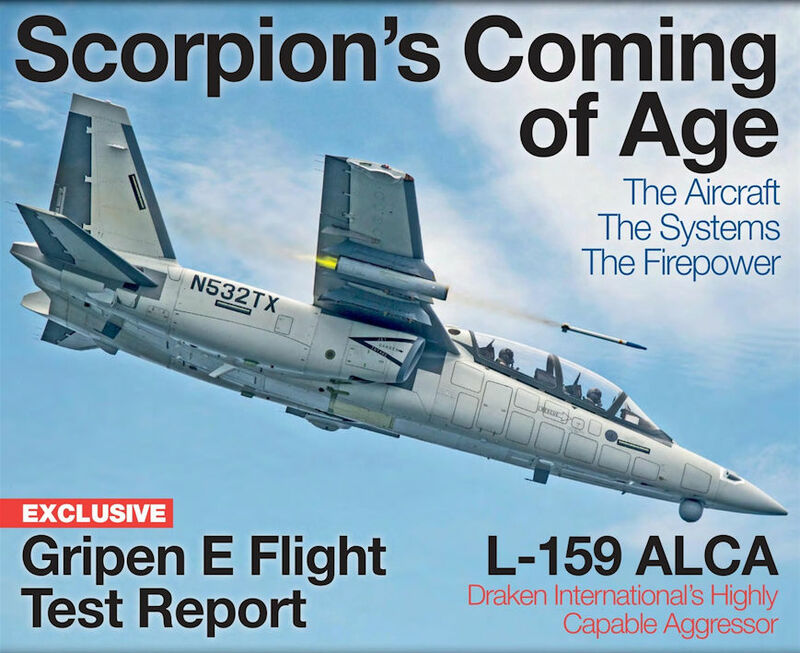 Scorpion N532TX simultaneously firing two 2.75- inch rockets over the Atlantic Test Range during a weapons separation detachment to Naval Air Station Patuxent River, Maryland in July 2017. 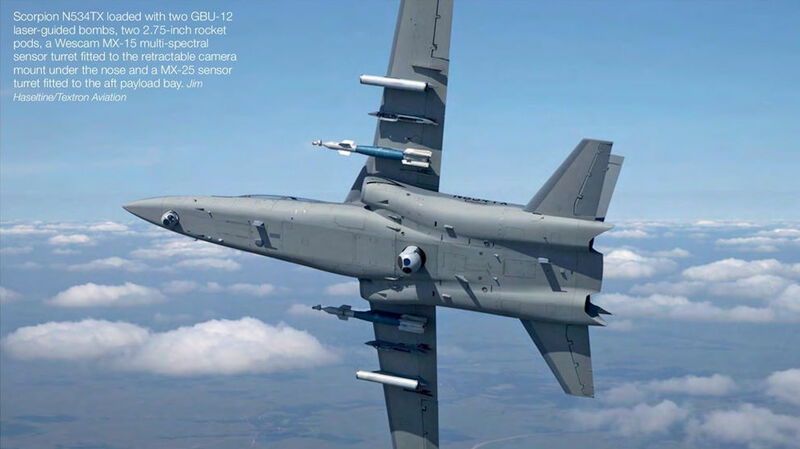 Scorpion N532TX releases an inert 500 lb GBU-12 laser-guided bomb from the left side inner pylon with an HMP-400 heavy machine gun pod loaded on the middle Station. 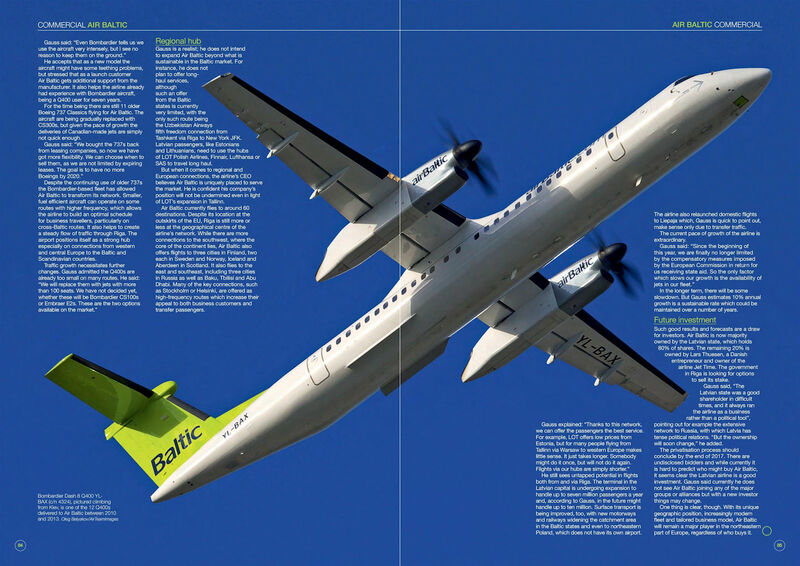 Bombardier Dash 8 Q400 YL- BAX (c/n 4324), pictured climbing from Kiev, is one of the 12 Q400s delivered to Air Baltic between 2010 and 2013. 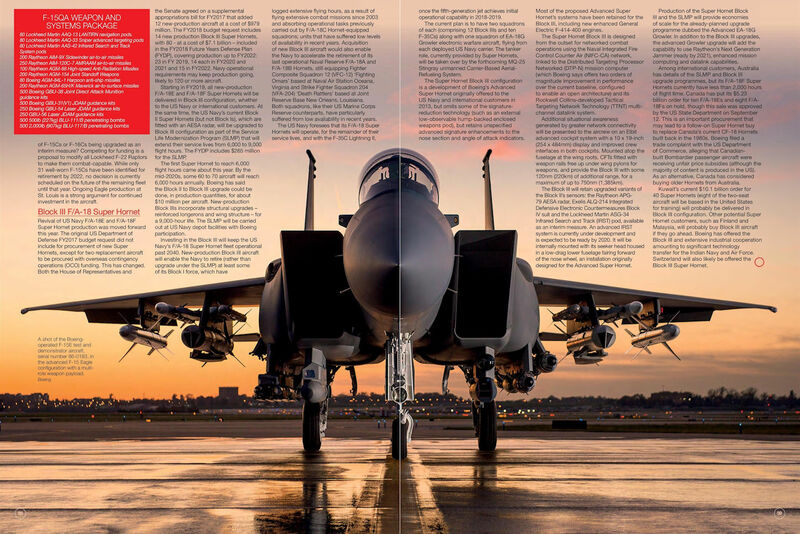 A shot of the Boeing-operated F-15E test and demonstrator aircraft, serial number 86-0183, in the advanced F-15 Eagle configuration with a multi-role weapon payload. 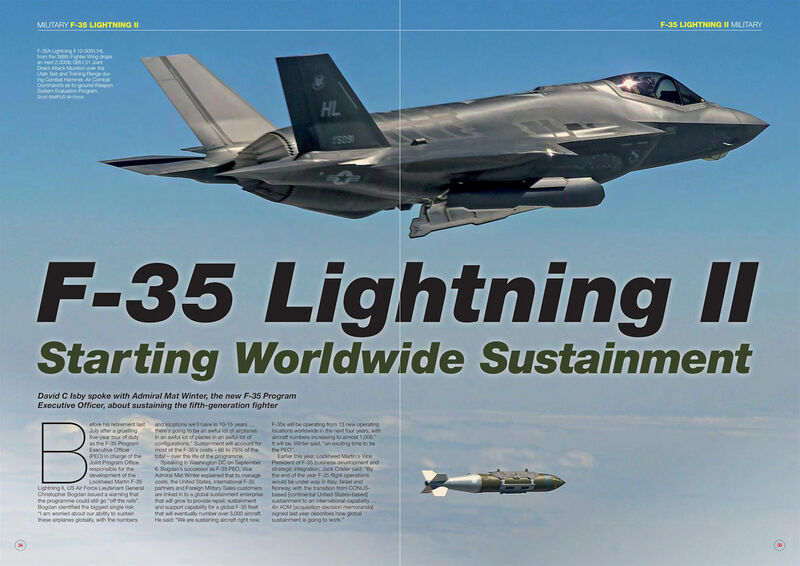 F-35A Lightning II 12-5091/HL from the 388th Fighter Wing drops an inert 2,000 lb GBU-31 Joint Direct Attack Munition over the Utah Test and Training Range dur­ing Combat Hammer, Air Combat Command’s air-to-ground Weapon System Evaluation Program. 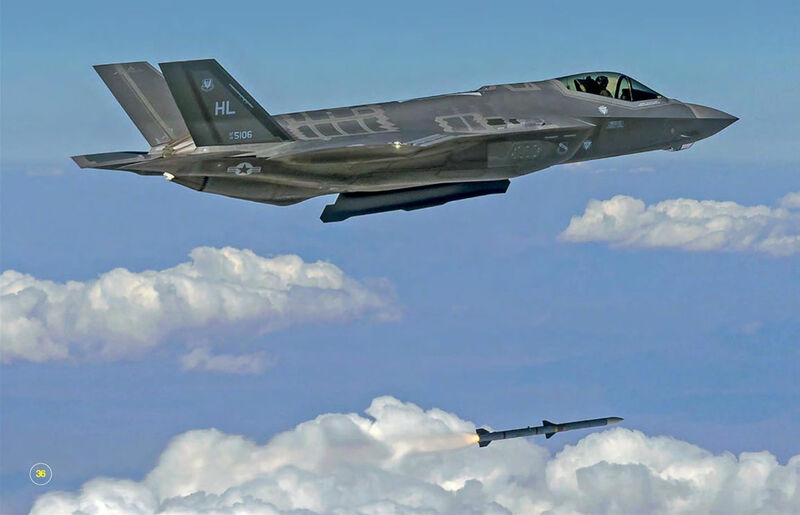 F-35A Lightning II 14-5106/HL from the 388th Fighter Wing fires an inert AIM-120C-7 missile at the Utah Test and Training Range during Combat Archer, Air Combat Command’s air-to-air Weapon System Evaluation Program. 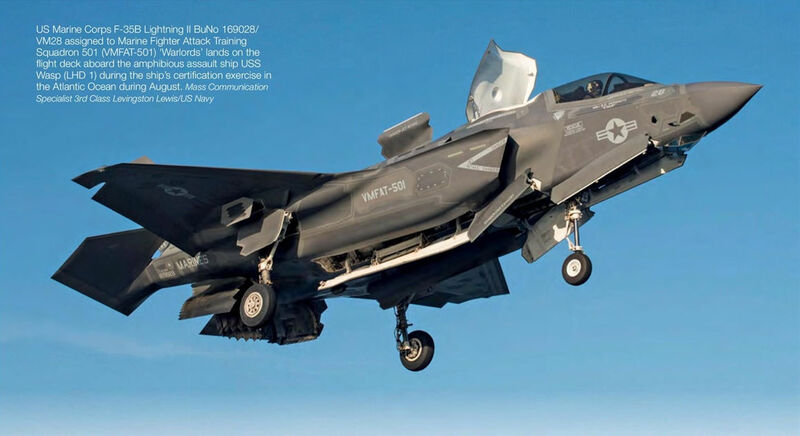 The Autonomic Logistics Information System is intended to be the same for all users of the F-35. 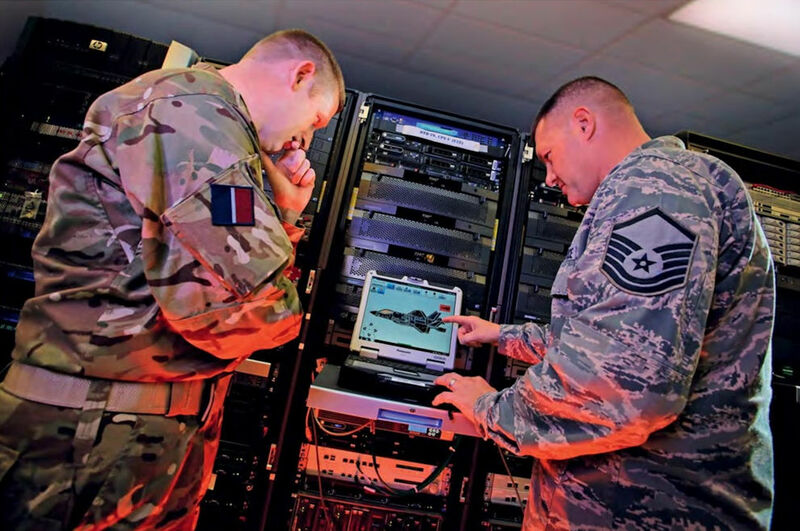 Here a US Air Force and Royal Air Force technician study an ALIS display at Eglin Air Force Base, Florida. 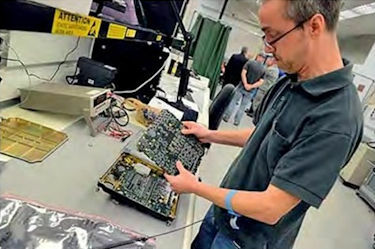 A 568th Electronics Maintenance Squadron technician at Robins Air Force Base, Georgia, removes a faulty circuit card assembly from a remote input/output unit, which is part of the F-35's communication system. F-35C Lightning II BuNo 169163/ NJ 124 of Strike Fighter Squadron 101 (VFA-101) approaches the flight deck of the aircraft carrier USS George Washington (CVN 73) for an arrested landing. 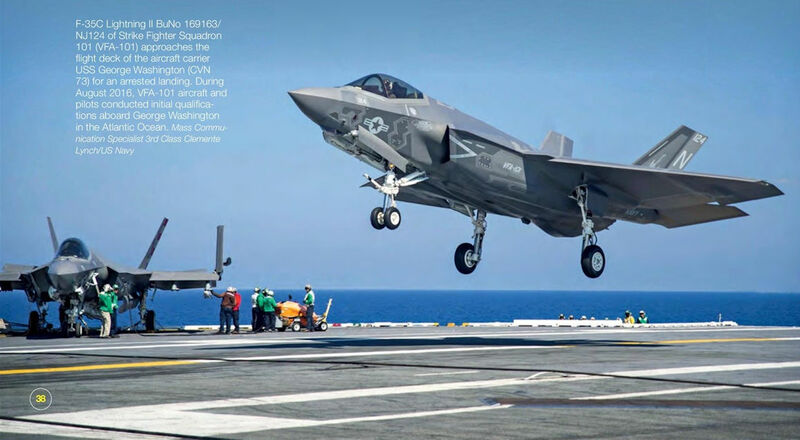 During August 2016, VFA-101 aircraft and pilots conducted initial qualifications aboard George Washington in the Atlantic Ocean.